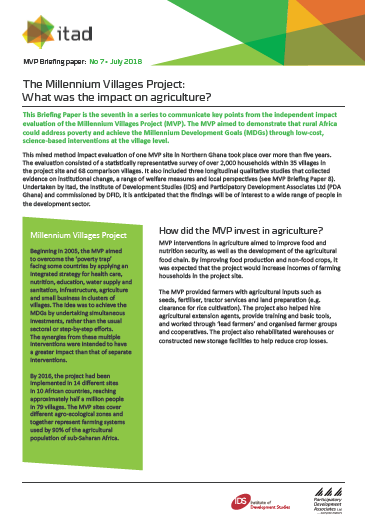 This Briefing Paper is the seventh in a series to communicate key points from the independent impact evaluation of the Millennium Villages Project (MVP). The MVP aimed to demonstrate that rural Africa could address poverty and achieve the Millennium Development Goals (MDGs) through low-cost, science-based interventions at the village level. MVP interventions in agriculture aimed to improve food and nutrition security, as well as the development of the agricultural food chain. By improving food production and non-food crops, it was expected that the project would increase incomes of farming households in the project site.